“Dear William. 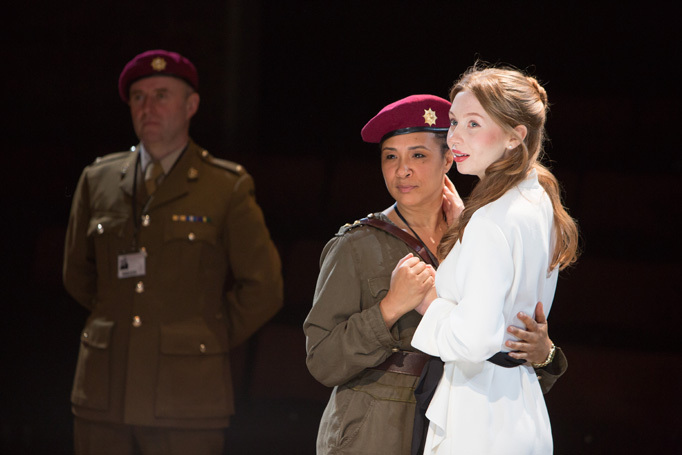 You are so lucky to be dead.” That was just one of the hundred or so comments underneath my Guardian review of Gemma Bodinetz’s revival of Othello at the Liverpool Everyman last week. But you would think from so many of the Guardian commenters – most of whom haven’t seen the production – that some kind of sacrilege has occurred. Why do people think that Shakespeare and other classic plays need protection rather than revelation? Why do so many seem to want to erect a wall around them with a large notice saying: “Hands off”. Many who took so violently against Emma Rice at Shakespeare’s Globe act as though they are culture police seeming to think the replica theatre is a museum, not a place to respond to the world around us. Even an intelligent playwright with a good theatre brain such as David Hare has, in the past, complained about UK theatre being “infected” by “over-aestheticised European” productions that “camp up the classics.” Innovation and invention are not a disease to be feared, but the tools by which theatre and classic plays remain relevant in a changing world. The truth is that if plays are not simply to become dusty volumes languishing on a shelf, they have to keep on being reinvented. As Simon Stone said, in relation to his Young Vic production of Yerma with Billie Piper as a 21st-century woman finding herself unexpectedly ambushed by the longing for a child, “the sturdiness of the original becomes apparent in the moment of reinvention”. Great plays are endlessly malleable and resilient survivors, even of Nahum Tate’s attempts to give King Lear a happy ending. In fact, what is viewed by some as cultural vandalism is often a lifeline for playwrights, keeping plays that might otherwise slip into obscurity alive. Tastes and styles in theatre change. It’s not all that long ago that Chekhov in the UK was largely produced with sets involving birch trees and casts who stared mournfully into the middle distance. That may have served mid-20th century audiences well, but it looks as dated and old-fashioned to modern audiences as barnstorming acting or limelight. Theatre has to move on, or it dies. Surely, with any play, we want it to feel as if it has been written for us and written just now. A few years ago, at the Nuffield in Southampton, the young man sitting next to me thought that Headlong’s superb, modern-dress revival of The Seagull had been written by a bloke called Chekhov who was still alive and the ink had barely dried on the page. I reckon Chekhov would have been enormously flattered. I suspect the same playwright, who in The Seagull speaks passionately about the quest for “new forms”, would be fascinated by RashDash’s very funny, very sharp take on Three Sisters, which is currently at the Royal Exchange in Manchester before touring to the Yard in London and Bristol’s Tobacco Factory. Not least because like Jess Thom and Touretteshero’s staging of Beckett’s Not I, or Stephen Daldry’s reinvention of JB Priestley’s An Inspector Calls, the production doesn’t just try to replicate the original text on stage but interrogates it to ask what this play says to us here and now in this very moment. Jess Thom’s neurodiversity, which means the text becomes peppered with the words ‘biscuit’ and ‘hedgehog’, brings new layers to Beckett’s play that has been in danger of becoming a virtuoso star turn. It makes us see the character, the play and, therefore the world, differently. Surely that is one of the purposes of theatre: to challenge our received world view? RashDash’s Three Sisters releases the play from its early 20th-century constraints and makes us ask questions, not just about this particular play, but why and how plays enter the canon as classics. They may reassign lines and cut others, introduce songs and treat the play with a lack of reverence, but they never demonstrate a lack of respect for Chekhov’s writing. They ease him into the 21st century with a helping hand as they ask, who and what are the classics for, and what is it that we can find in classic plays that speak of our own experience today? They are keeping the play alive with wit, music and rigour. But I won’t be surprised if in the comments thread below my review someone posts: “Dear Anton. You are so lucky to be dead.” However, I doubt he would agree.